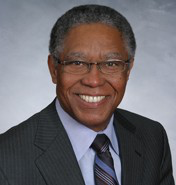 Daniel T. Blue, Jr. is the managing partner of Blue LLP. Dan represents several individuals and businesses in civil litigation, administrative, estate, and public finance matters. He is regarded by his colleagues as an exceptional lawyer, and has represented clients throughout the United States. He has been awarded the Joseph Branch Professionalism Award, the highest honor bestowed by the Wake County Bar Association, and several other awards from statewide lawyers groups. Dan earned a B.S. degree in Mathematics from North Carolina Central University in 1970. Thereafter, he attended Duke University School of Law, where he distinguished himself and graduated in 1973. Upon graduation, Dan was hired by one of North Carolina’s leading law firms, Sanford, Cannon, Adams & McCullough (now Parker, Poe, Adams, and Bernstein LLP), and became one of the first black attorneys to integrate one of the state’s major law firms. In 1980, Dan was elected to the North Carolina House of Representatives, representing Wake County. He was re-elected ten times, and held several leadership positions in the House, including chairman of a Judiciary and Appropriations Committee. He also served as Chairman of the Legislative Black Caucus from 1984-89. On January 30, 1991, Dan was elected Speaker of the North Carolina House of Representatives. He was re-elected in January of 1993. After serving twenty-two years in the House of Representatives, in 2002 he left the Legislature to run for the United States Senate. Dan returned to the House in 2006 and was selected to replace the late Senator Vernon Malone in 2009. Dan has been recognized throughout the state and country as one of America’s outstanding political leaders. He is the recipient of dozens of national and state awards, including the 4-H National Alumni Award and the Adam Clayton Powell Leadership Award. He has served on the executive committees of the Southern Legislative Conference, the State and Local Legal Center in Washington, DC and as a member of the Democratic National Committee. He also served as President of the National Conference of State Legislatures. Dan Blue is the recipient of nine honorary doctorate degrees from: Barber Scotia College, Elizabeth City State University, Fayetteville State University, North Carolina Central University, Pfeiffer College, Saint Augustine’s College, Shaw University, the University of North Carolina at Chapel Hill, and Winston-Salem State University. He has been a visiting instructor at the Sanford Institute of Public Policy at Duke University, and also a faculty member of the National Institute for Trial Advocacy. Dan previously served as Chairman of the Board of Trustees of Duke University and Vice Chair of the Executive Committee of the Board of Trustees (Chair-Business and Finance Committee; Vice-Chair-Audit Committee), the Executive Committee of the Duke University Health System (Chair- Audit and Compliance Committee), the Executive Board for the Center on Ethics in Government and Advocacy in Denver, Colorado, and the Advisory Council for the Association of Governing Boards for Colleges and Universities in Washington, DC. He serves as a corporate member of the Research Triangle Institute. Additionally, for several years Dan was a frequent commentator on N.C. Spin, a weekly television program on North Carolina political events, which is aired on dozens of radio and television stations.